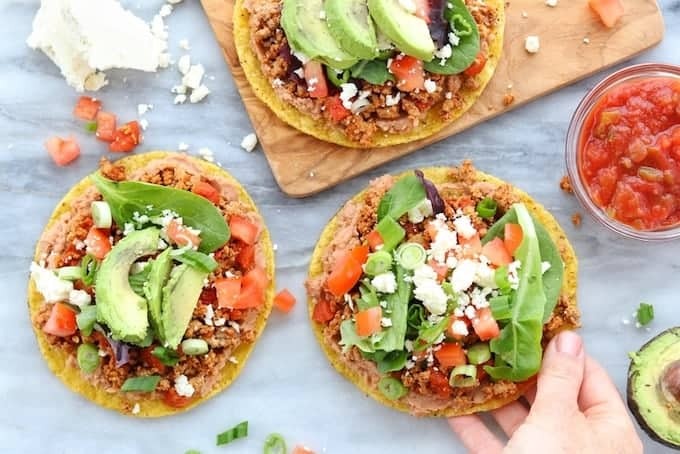 Delicious ground chicken tostadas are a fun, healthy dinner idea. Mexican tostadas take just minutes to make and are a delicious twist on classic tacos. Easily swap ground meat for beef tostadas. 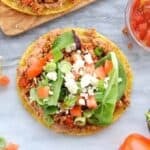 This chicken tostada recipe is going to become one of your favorite meal ideas because they are simple, delicious & kid-friendly. Plus, the entire recipe is made and served in just 3 steps – how awesome is that?! In case you haven’t noticed, I love to serve Mexican flavored recipes for dinner. 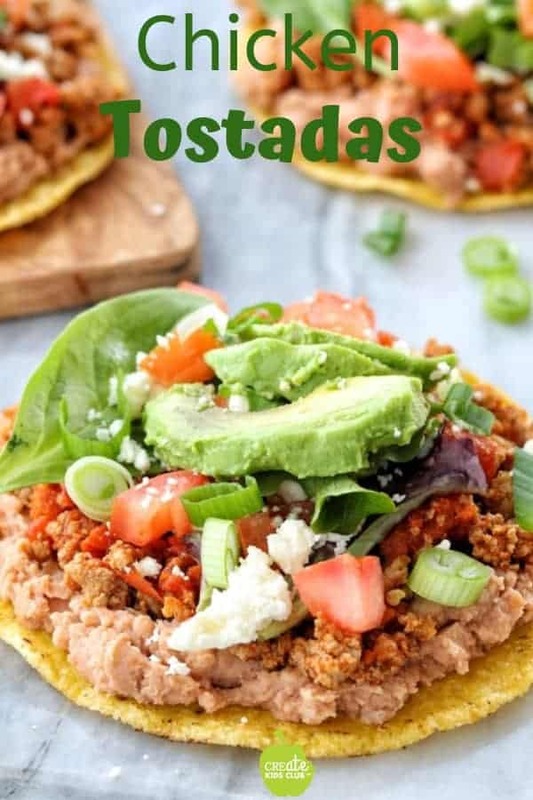 My family is constantly requesting tacos but I like to change things up and this tostada recipe is the newest dinner option! Check out this video for step-by-step instructions on how to make a Mexican chicken tostada recipe! Brown ground chicken in a medium-sized sauté pan. Add taco seasoning and Rotel tomatoes, stir. Spread refried beans onto tostada, top with meat mixture and add veggies and cheese of choice. Start by browning ground chicken in a sauté pan over medium heat. INGREDIENT SWAP: Replace ground chicken with shredded chicken, baked chicken breasts, ground beef or pulled pork. Once browned, add a can of Rotel tomatoes and taco seasoning. I highly recommend making a batch of my Chicken Taco Seasoning to keep in the kitchen for this recipe & other recipes. I find myself using chicken taco seasoning for burritos, tacos, nachos & salads. PRO TIP: Let your meat simmer for at least 10 minutes with the spices and tomatoes for a richer flavor. While the chicken is simmering, chop the toppings and scoop the refried beans into a bowl. Over the years, I have tried different recipes for refried beans because they are one of my daughter’s favorite foods. Finally, I found the perfect combination of spices and beans and developed my recipe for Crockpot Refried Beans, which I make and serve with the chicken tostadas. 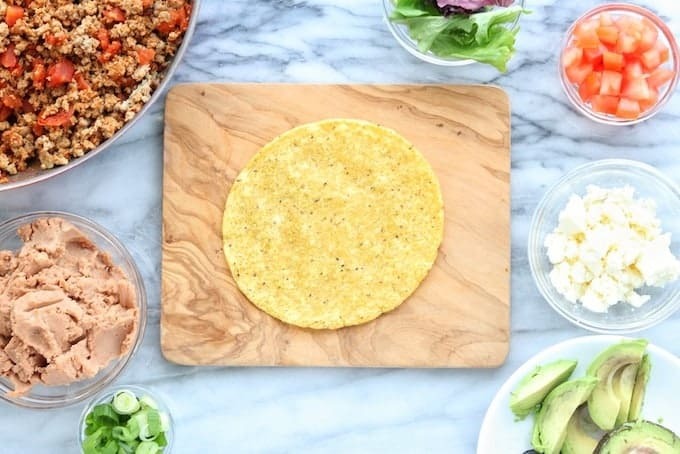 When it comes to setting the table, add a variety of taco toppings, refried beans and a stack of tostada shells. Tostada shells are definitely a staple on my grocery list and you can almost always find a bag in my pantry. However, did you know that you can make tostada shells from scratch? Love this idea! Check out this Baked Crisp Tostada Shells recipe. I am definitely heading to the kitchen with my kids to make a batch of these homemade tostadas. PRO TIP: Add a splash of lime juice to your homemade tostada before or after baking for extra flavor. My favorite part of any Mexican recipe is the toppings because you can’t go wrong. I truly think that I could make an easy Mexican dish every night & find a new topping combination each time. Your family will love being able to customize their own dinner. This is the secret I use when trying to get my kids to eat a few more vegetables. They love picking what they want, rather than me deciding for them! I am going to encourage you to put a variety of your dinner table and let your family get creative. 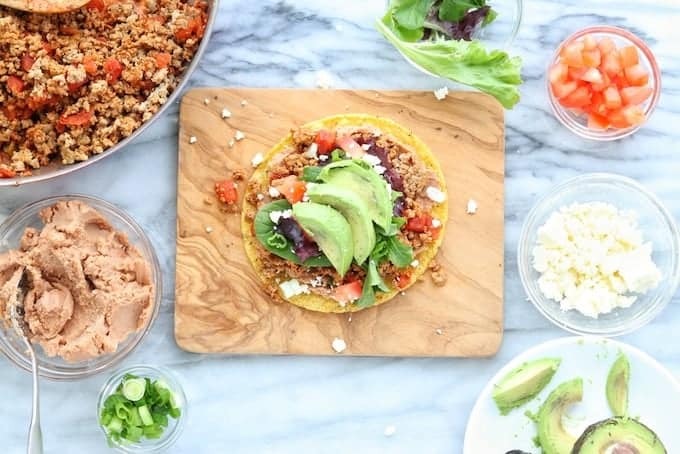 You might be surprised what they add to the top of their tostada! While I love to spend time in the kitchen making healthy and tasty dinner recipes, some nights I need a super quick and simple recipe. These chicken tostadas took me under 15 minutes to make and my entire family was impressed. That is a success in my book! This recipe will definitely be on our dinner table again in the near future, and I hope yours as well! 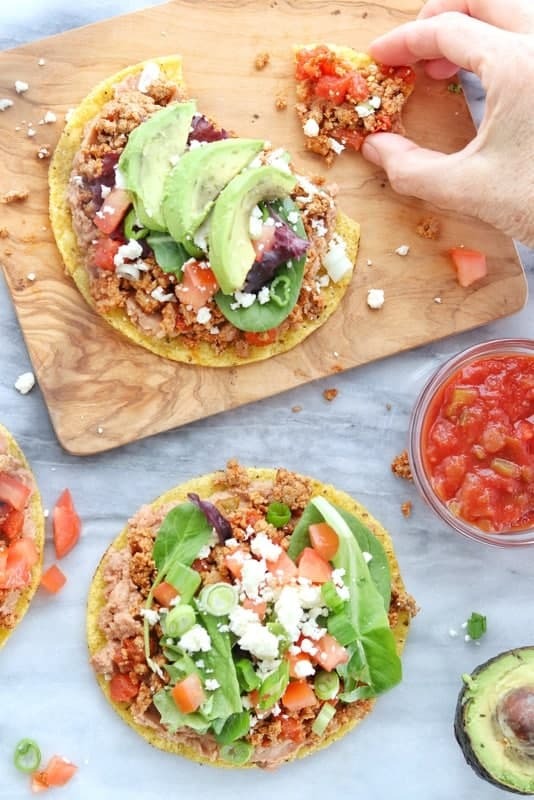 Delicious ground chicken tostadas are a fun and healthy dinner idea. These chicken tostadas take just minutes to make and are a delicious twist on classic tacos. Brown ground chicken in a medium sized saute pan. 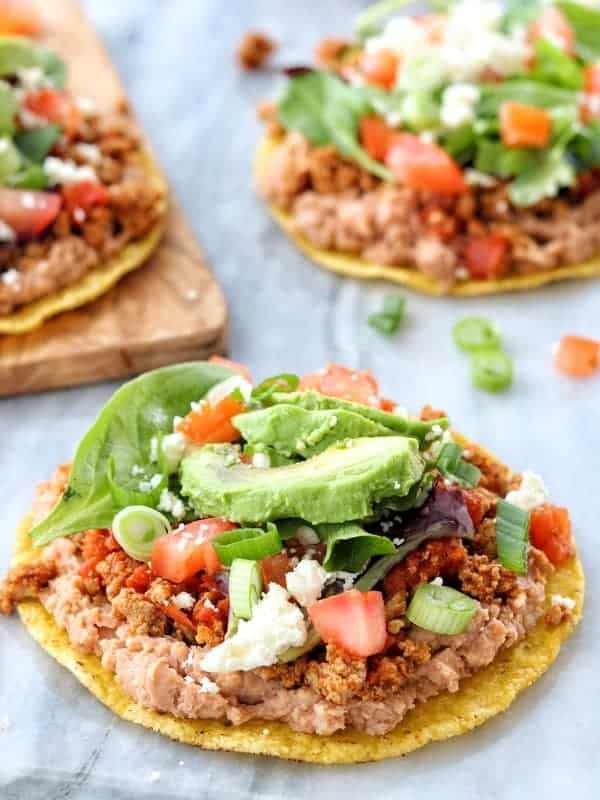 To serve, spread refried beans onto tostadas and top with meat mixture. Place veggies and cheese onto the dinner table and let your family customize their own dinner!